Although designated in the F8C series, the XF8C-2 and XF8C-4 differed extensively from the F8C-1 and -3, and were dual-role aircraft intended for use both as two-seat fighters and as dive bombers, dive bombing techniques at that time being under development by the US Marine Corps. Possessing smaller overall dimensions than previous F8C series aircraft, featuring some structural revision and powered by a 450hp R-1340-80 Wasp, the XF8C-2 prototype appeared early in 1929 and was equipped to carry either two 53kg bombs or one 227kg bomb. 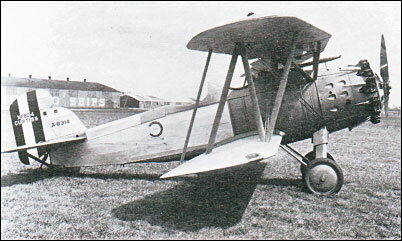 A second prototype, the XF8C-4, was flown in August 1929, by which time orders had been placed for 27 F8C-4s and nine F8C-5s. The XF8C-4 differed from the XF8C-2 primarily in having an R-1340-88 Wasp enclosed by a Townend ring. The latter was not initially applied to the production F8C-4s which were delivered from May 1930, a further 43 being ordered for 1931 delivery, these being redesignated O2C-1s. Two F8C-5s temporarily fitted with wing flaps and leading-edge slots were designated XF8C-6s, one VIP transport version with a 575hp Wright R-1820-64 Cyclone was designated XF8C-7 (XO2C-2) and two similarly powered examples were XF8C-8s. The designation XF10C-1 was assigned to one aircraft initially powered by a Curtiss R-1510 and subsequently re-engined with a Cyclone. I read that F8Cs were also the planes in the original King Kong. These aircraft were featured prominently in the 1931 MGM motion picture "Hell Divers", starring Wallace Beery and Clark gable, operating from the old aircraft carrier USS Saratoga, along with the Navy's Rigid Airship USS Los Angeles (ZR-3). Fairly ridiculous story, but great vintage aviation footage! The movie was on Turner Classic Movies today, 12/17/2011. Great movie showing flight ops on the Saratoga in the early '30s. MY FATHER DIED IN THIS HELLDIVER 19XX MAY HIS SOUL REST IN PEACE! I first saw a Helldiver F8C-4 from NAS Squantum(near Boston) and destined to go on the USS Lexington in 1928. A movie was mad starring Wallace Beery and Clark Gable. Is a VHS tape or DVD of that movie"Helldivers" available? I saw the original movie.